The other night I asked my children to tell me about some books they had read recently that they would recommend. The first thing they said was "Is this for your blog?" I can't imagine why they asked that. My son reeled off a list of books for me and said I could write whatever I wanted but he refused to let me take a picture of him reading to put at the top of this post, much to my disappointment. Some of these are books he has read over and over, some are books he has read recently.
" It's five years after Return of the Jedi: the Rebel Alliance has destroyed the Death Star, defeated Darth Vader and the Emperor, and driven out the remnants of the old Imperial Starfleet to a distant corner of the galaxy. Princess Leia and Han Solo are married and expecting Jedi Twins. And Luke Skywalker has become the first in a long-awaited line of Jedi Knights. 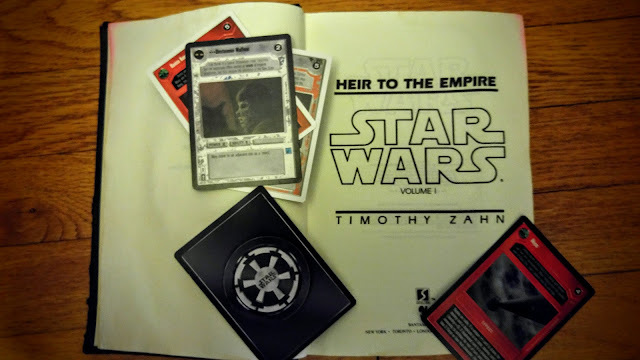 But thousand of light-years away, the last of the emperor's warlords has taken command of the shattered Imperial Fleet, readied it for war, and pointed it at the fragile heart of the new Republic. " My son loves these books. He has read them over and over since he was about eight. They are not kid's books, he just was determined. I asked him why he recommended them and he said "Because they are great." So there you go. You might notice that his copy of this book is water damaged and stained slightly pink. That was a tragic day. I put his water bottle in his backpack and didn't tighten the cover enough and well, you see the results. I offered to replace it but he refused because it wouldn't be the same. He said it was part of his childhood. Yes, I felt bad and yes, he knows it is ammunition. Books matter. Next, we have another series by Timothy Zahn. 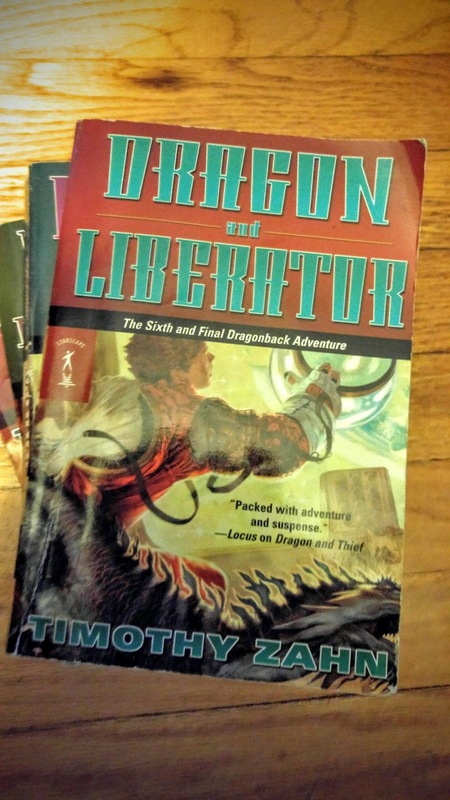 The first book is Dragon and Thief. This I have actually read, unlike the Star Wars books, and I enjoyed it. It is a young adult book but you could almost forget that which I view as a plus. Jack Morgan is a 14-year-old hiding out from people who are framing him for a crime. When a spaceship crashes near him he rescues the only survivor who happens to be a K'da warrior. The twist is that the K'da look like small dragons and can only survive for six hours before having to have a humanoid host. The two join forces and adventures ensue. Third, we have the Redwall series by Brian Jacques. These are some more of my son's comfort reads. He has been reading them over and over since he was very young. Now my daughter likes them too but maybe not with quite the same devotion. 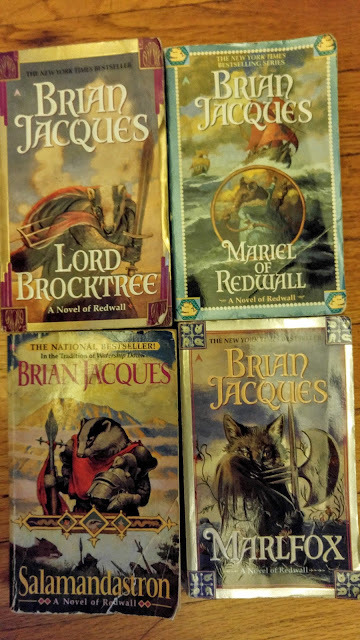 These are a series of 22 fantasy novels involving anthropomorphic animals and the adventures they have in the Redwall world which seems to be the medieval British countryside. These adventures usually involve some kind of expedition and battles against a vermin horde. There are many, many descriptions of feasts. In fact, for a fourth-grade school project we found a Redwall recipe site and made blueberry biscuits for my son to bring in as part of his presentation. 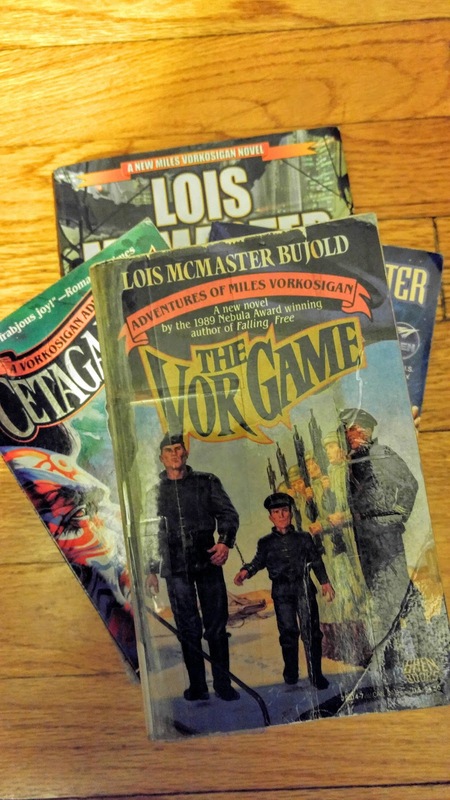 Next, we have the Miles Vorkosigan novels by Lois McMasters Bujold. I actually recommended these to him recently and he hasn't quite finished the series yet. Miles is the son of Barrayan Prime Minister Aral Vorkosigan. A poison attack when his mother was pregnant with him left Miles with brittle bones and stunted growth. His outsize personality more than makes up for it. He runs at adventure full-on, doesn't let anything stop him and his slightly obnoxious personality is infuriating and lovable all at the same time. The books go back and forth in the timeline but they are all fun, well-written and sometimes laugh-out-loud funny. Planets are always at war, Miles is always unstoppable, and somehow the craziest world seems believable while you are reading. I agree with my son, read them. Even if you don't like science fiction, read them. They are not just ships blowing each other up and crazy aliens though there is that too. Bujold does a great job at making her characters grow and develop and become real people even while they are having unreal adventures. Great idea! I do post about what my kids are reading every now and then, and I generally ask them, "Hey, of the books we've gotten from the library lately, which ones did you like best?" and then kind of combine their answers with mine, hee. My daughter has a list of books so I can write a post about her next. I love the enthusiasm!